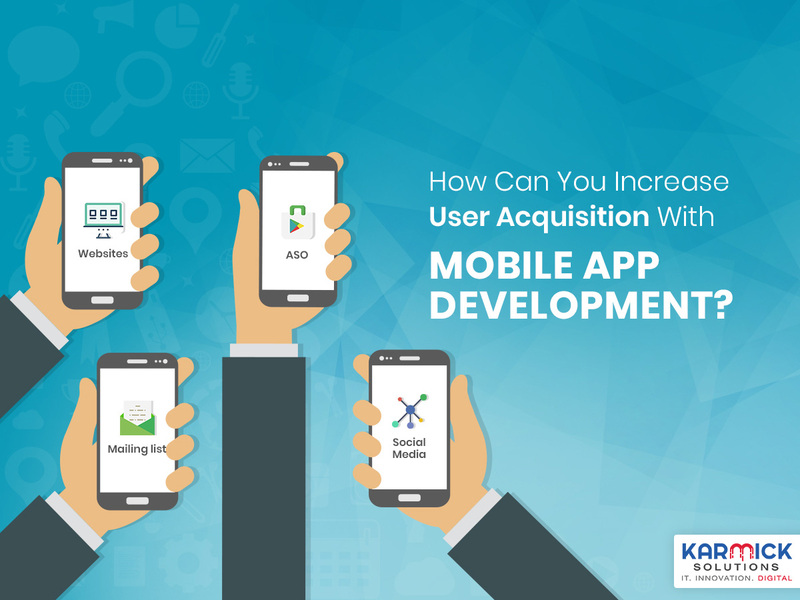 How Can You Increase User Acquisition With Mobile App Development? Today, there are about 2.2 million apps in the Apple App store and 2.6 million apps in the Google Play Store. Mobile App accounts for about 92 percent of all the users time spent on mobile in the US. With every passing day, it is becoming an increasing challenge to have one’s app stand out from this crowd. User acquisition may be defined as the persuasion of target customers to use or download one’s app. User acquisition is probably the most important metric through which all organizations measure how much value is being added to their top line. Cost per install (CPI) – This about $3.15 in the US. This is an expensive and not an efficient way to acquire users. Cost Per Action (CPA) – This is defined as the cost of converting a customer. ROI – This is used to determine if the users who have been acquired are actually adding value to the company. Customer acquisition cost (CAC) – This is defined as the total acquisition cost divided by total new customers. It is important to optimize one’s app inside the App store after it is launched. Keywords should be put in the (app) app description and the app title. However, care should be taken to ensure that there is no keyword stuffing. Through the title and the description, you have to strive to convey to the key demography the benefits of using our app. Social media is one of the most important parts of any user acquisition strategy. Social media is a great way to reach out to the target audience. Some of the common strategies employed by marketers when working with social media are to follow industry leaders and well-known communities. Social media is probably the easiest and the quickest way to reach out to the key demography by making content go viral etc. Create a profile of your top customers in order to better target the future users. When building segments, it is important to have more than one with separately defined parameters in order to be able to reach out to customers with separate goals. According to e-marketer, digital ad buys in 2017 will top $82 billion and video ads will account for about 15% of that. Mobile video ads consumption is increasing at the rate of 100% every year. Video content is hugely popular. In fact, speculation is that video ads may rival social media as a viable marketing strategy in the coming few years. Some of the most common tools used for video ads are Loop Me, Inneractive, and YouTube Mobile Video Ads. Content marketing is a very good way to reach out and increase the user acquisition for any app. There are many platforms online which allow you to sign up and talk about your product for free. However, just engaging these platforms in order to market one’s product will not work. Instead, you need to participate and engage customers and convince them into trying out your products. This will happen primarily through engagement via refreshing, entertaining and informative content. Some of these content platforms are Buzzfeed, StumbleUpon, Product Hunt and Quora.